Find influencers based on vertical, number of followers, unique characteristics and passions. Use our thoroughly researched interest and cause tags to quickly determine if an influencer fits your brand. 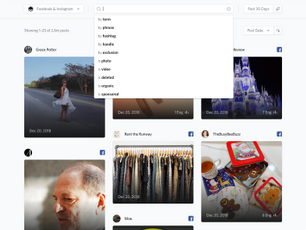 Filter your search by audience age, gender, income, brand affinities, interests, and more. 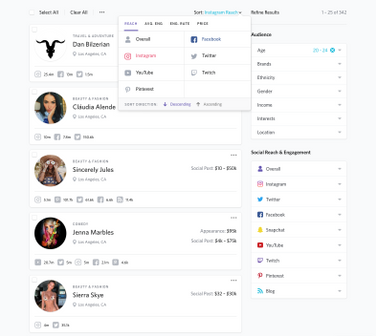 Evaluate influencers based on their total reach, average engagements, or engagement rates across seven social media channels, and easily compare performance of sponsored and organic content. Our team of researchers, paired with raw social network data, deliver insights with unparalleled depth and accuracy. Know precisely who an influencer is before working with them. From broad topics to niche interests, get a feel for an influencer’s background, content, and values. View their brand relationships, supported causes, and interests in one place. Understand who an influencer appeals to – who their followers are, where they’re from, how old they are, how much money they make, and more. Deep-dive into an audience’s brand, preferences, location, demographics, and interests. Compare the performance of an influencer’s sponsored and organic content based on engagement and reach. 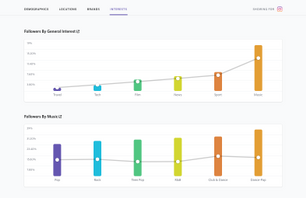 View average engagements, unique monthly visitors, and total reach over time, and pinpoint the best time to run a sponsored post.